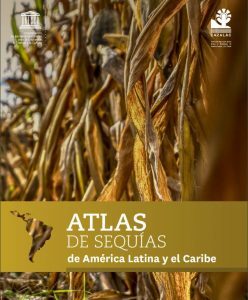 In October 2018, after over a decade of effort, a Drought Atlas for Latin America and Caribbean was released by UNESCO-IHP and the Water Center for Arid and Semi-Arid Zones in Latin America and the Caribbean (CAZALAC). 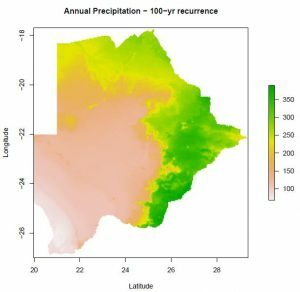 The Atlas uses Regional Frequency Analysis (RFA), based on a statistical method called L-moments, to assist drought planners and decision-makers in both public and private sectors. ICIWaRM was involved in the early stages of planning for the Atlas, and developed its own program for regional frequency analysis, called ICI-RAFT. During an African regional workshop on “Climate Change Risk, Vulnerability Assessment and Early Warning for Africa”, held on 13-16 June 2017 at the AGRHYMET Centre in Niamey, Niger, the need had been identified to develop a similar atlas of hydro-climatic extreme events in the Africa region. In response, a week-long, “train the trainers” course on RFA for African meteorologists and hydrologists was held at UNESCO headquarters in Paris, France on October 22-26. Preliminary map of the 100 year recurrence interval for Botswana, produced during the training course. The goal of the training was to capacitate key representatives from regional centers in Africa on the use of RFA in order to build capacity in the region for dissemination of the methodology, as well as to prepare for regional trainings in a follow-up project. Preliminary drought maps were produced for each of the 10 African regions represented, with the long-term goal being the creation of an African Drought Atlas (ADA). Country representatives will continue to work to verify/update data, and to evaluate and adjust the methodology as needed for to the African regions. CAZALAC led the course and provided the R-script code used in the analyses. The course was organized by UNESCO IHP through the Enhancing Climate Services for Improved Water Management (CLIMWAR) project and G-WADI programme, and the European Commission’s Joint Research Center also provided support. Dr. Jennifer Olszewski of ICIWaRM attended and assisted with the training.